I saw this screenshot and was wondering how to customize Beryl to look like the shot. It looks cool so are there any extra plugins i need? as far as i know its one of the default views in beryl/compiz , there are clips of it on youtube, ask someone there or use google. No plugins necessary really. If your on Ubuntu it is extremely easy just go to Add/Remove and search for Advance Desktop whilst remembering to have all available software selected. When done downloading and installing just go to system and it should be there. 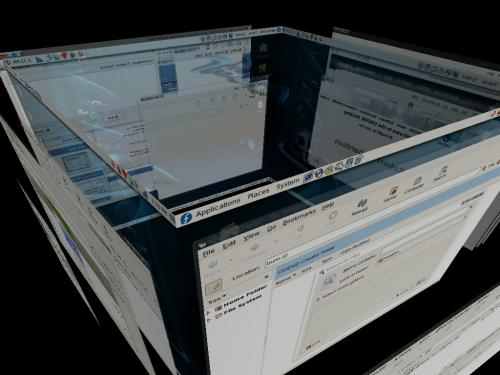 Now configure 3D windows and Rotating Cube in the settings and there you go! Hope that helped. Yeah, you can "sudo apt-get install ccsm" as well. That's how I did it, I didn't even think of doing it through the package manager. here posted how to do it. Is it his fault the question was asked of, 7 months before he joined. In seeing it was that easy, i'd want to try ubuntu myself now. And btw, familiarize yourself with the rules. 15a. If you are not a moderator, you do not have the right to, in any way, attempt to moderate the forum. Doing so will result in a warning. Repeat offenses will result in a ban. Last edited by Dion on Thu Aug 14, 2008 1:57 pm, edited 2 times in total. 5a. The bringing up of topics over 30 days is allowed if the reply is worthy and contains valuable information that can be used.